... We are set to close on our house this Friday. Between now and then, there's a very large, very dead tree in our neighbor's yard that hangs precariously over our house that absolutely has to come down. God is big enough for that. If you think of us, please pray that the tree comes down before Wednesday and doesn't inflict any (more) damage to the house in the process. ... Sundays are loooong days for us with three services and usually a Sunday evening service, too. But we are loving our church and basking in the warmth of Christian community here. We've only been here a month and we've met more incredible people than we even have time to get to know. I'm not sure if I should chalk it up to the perks of being on a church staff (and, therefore, having a ready-made community) or just that our church is amazing. Probably both. Either way, I'm grateful. ... We've been park hopping around Raleigh, trying to land on our favorites. 1. Lake Johnson: a 5k loop, water views, hills, boat rentals (! ), concession stand with coffee and tea and snacks (!!!). This park is pretty perfect in our minds. 2. Lake Lynn: beautiful lake views and ducks! 3. Shelley Lake: pretty busy on some days, but still so beautiful and safe, too. Any fellow Raleigh friends have other suggestions? Preferably stroller friendly? 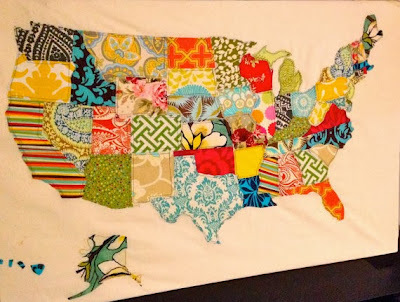 ... My sister is starting to make these amazing made-to-order fabric maps in her Etsy shop. Check them out. You can even customize them and giver her a color scheme to go with. I love this idea for a kid's room! PS - The photos of Liam? 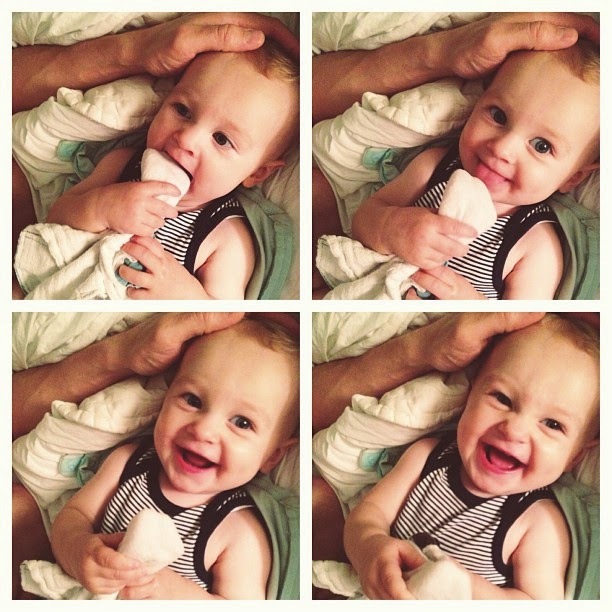 They have nothing to do with the post, but were taken past midnight when he was in too much teething pain to sleep. Poor little man. But it's still so easy to make him smile, even when he's hurting. I love that about him. What an exciting week! Will pray for patience and blessing... Love what your sister made. Would she be able to do different maps? Totally agree. I'm already feeling so sentimental about him coming up on his first birthday. Why do they ever have to grow up?! Pullen Park is a favorite of mine, as is Lake Johnson. I've heard great things about the trails around the art museum. They've got paved trails throughout and even have some outdoor sculptures. It's definitely on my list of places to go- I'm ashamed I haven't been yet! And besides usually very the foremost effective issue related to, your initial investigate of your payment day and besides Fitting Mortgage is de facto captivation totally FREE!!! That’s ideal. Anyone need to not pay one specific dime pay day loans near me at corona associated with captivation on the initial investigate. This payment day and besides Fitting Mortgage goes to be thought to be among all of our hottest money product, the implies that it is so hassle-free equally as accommodating.